Zurück zur Übersicht | Empfehlen | Auf den Merkzettel | Auf den Wunschzettel | [?] Sie haben Fragen zu diesem Artikel? Reflects a tasty spectrum between early Pink Floyd, 60s garage/flower-power and Loner Folk. 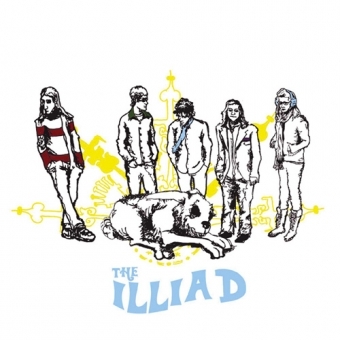 The Illiad is a young quintet from Ohio. A creatively produced demo put World In Sound´s attention to the band leader Kyle Pittman, an introverted and deeply emotional singer and guitarist. "A Sad Day on Pluto" was recorded in Cleveland, Ohio (2007) and contains 13 original tunes reflecting a tasty spectrum between early Pink Floyd jamming, 60s garage/flower-power and loner Folk style, and feature very catchy lyrics combined with interesting "psychedelicate" melodies. Pittman´s music captures a unique style of composing fresh music with the influences of Syd Barrett´s Pink Floyd, West Coast Pop Art Exp. Band, Velvet Underground, Marc Bolan and David Bowie. The mixing, mostly done by Pittman himself is truly a "trip in time", a stereo-experimental 60s style like Pink Floyd's Piper at the Gates of Dawn! With expressive vocals, screeching guitar hooks and sunny Farfisa sounds in these electric tunes and classic ballads, the Illiad create the beginning of a fantastic voyage into a concrete vision of dreamy songs. The CD comes with a 16 p. booklet and is well produced (intense sound)! This album is highly individual and part of the new generation of 60s influenced bands. It´s a kind of masterpiece for today with the sound and ideas from back then.